Presentation: "Art of Radical Courage and Change in Troubling Times: Creative Personal Movements through Expressive Arts and Improvisational Contact Engagement in Gestalt Process." 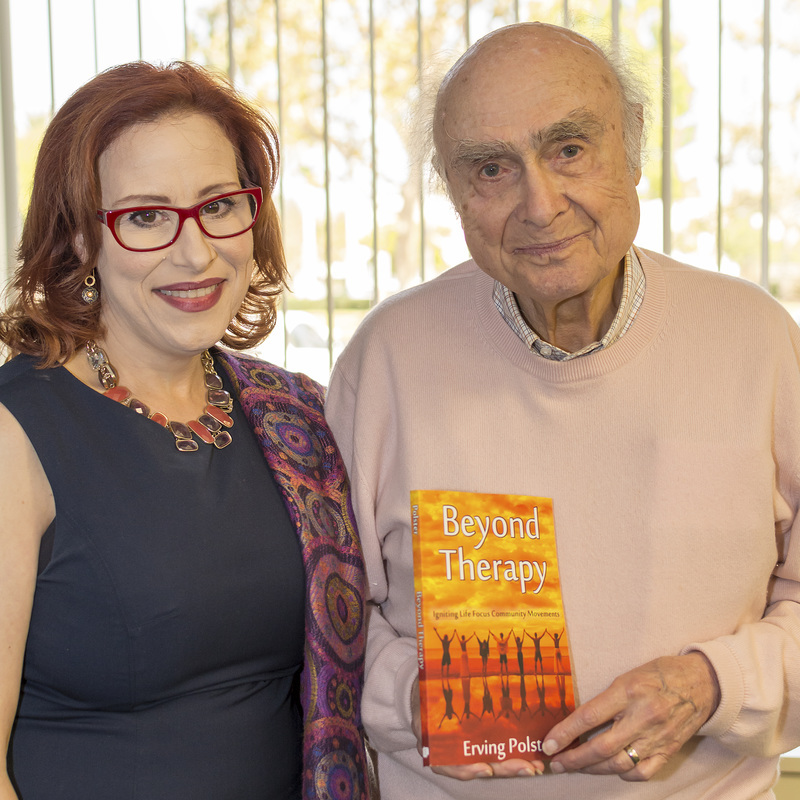 Dr. Paltin had the grew pleasure of co-presenting with her great friend and colleague Renowned Master Gestalt Therapist and Author Dr. Erving Polster, on the subject of Gestalt Therapy and Life Focus Communities in Orange CA as part of the Mindful Life Focus Community Experience, and in San Diego and Costa Mesa at National University as part of the Psychology Department Distinguished Speaker Series which Caroline developed and moderates. Dr. Paltin's ongoing research funded by the College of Letters and Sciences examining live musicians and individuals with trauma history interacting in contact experience. This phenomenological study seeks to examine the lived life of the individual participants to better examine encounters of human experience in Gestalt facilitated activity. A thematic and conceptual discussion of Polster’s key assumptions and the Life Focus Model will begin the presentation. This will include overview of current grant funded research being conducted by Dr. Paltin on the uses of Life Focus with Traumatized and non-traumatized individuals. 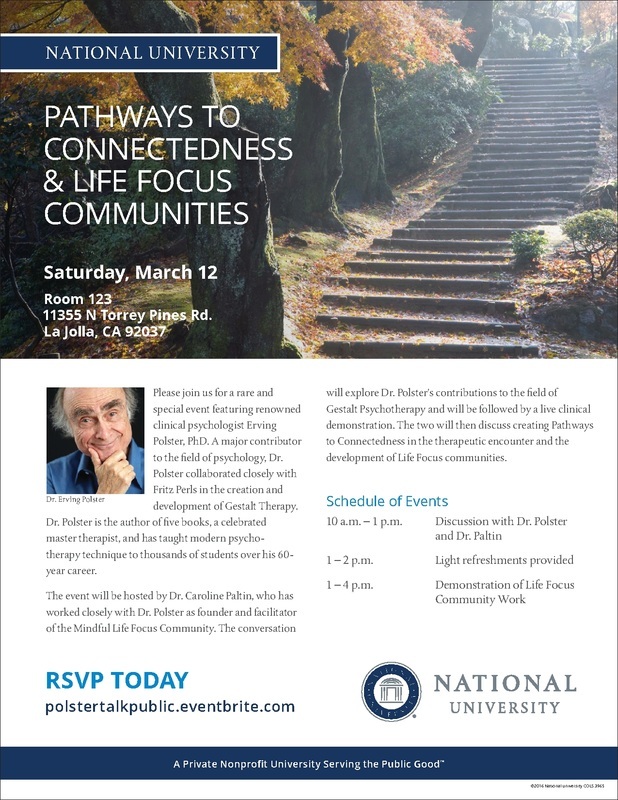 Attendees will then engage in experiential exploration of self-other inter-relatedness via Erving Polster’s Life Focus Community Movement, an approach detailed in his recently released work Beyond Therapy: Invigorating Life Focus Community Movements (Polster, 2015). creates common ground to explore our lives, amplifying self-other contact, and Intersubjective meanings. With art-infused conversation, music, poetry and more, these on-going gatherings explore co-creation of meaning in deep listening and experiential activities. Moving beyond confines of therapy, Life Focus Groups spark awareness of contact, freshly amplifying the experience of otherness, commonality, and richness of the lived life. Attendees will experientially explore the concept envisioned by Polster, with Caroline Paltin, who has worked closely with Polster in development of an ongoing Community. The primary activity will be a live demonstration of Life Focus with music on the theme of Belonging and Otherness and an experiential led by Marilyn Lammert exploring utilization of Life Focus in our lives.